Congratulations Mark Arendz, 6-time medalist and Canada's flag bearer! 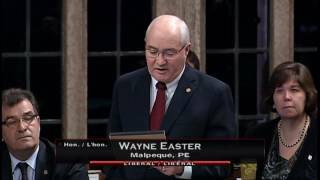 Added April 10, 2018 from MP, Wayne Easter. 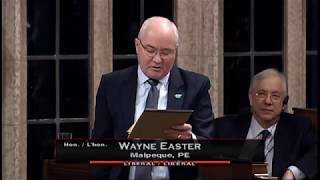 SO-31 delivered in the House of Commons on February 7, 2018 regarding my participation in the DND Parliamentarians at Sea Program. 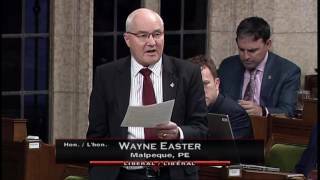 Added February 24, 2017 from MP, Wayne Easter. It was an honour to present a Standing Order of congratulations on Wednesday, February 15th, 2017 to Prince Edward Island resident, David Thompson, on receiving the Distinguished Alumni Award from the Dalhousie Faculty of Agriculture. 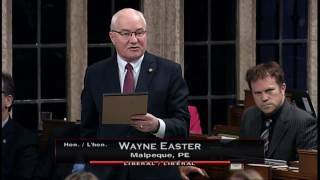 On Thursday February 2nd, 2017 it was an honour to pay tribute to a dear friend, Marie Hendricken who recently passed away. 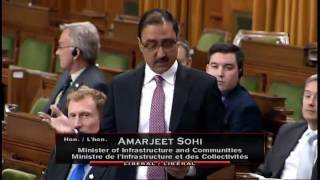 On November 25th, 2016 in the House I asked the Minister of Infrastructure if the new funding is ready to meet the critical export needs of Atlantic Canada. 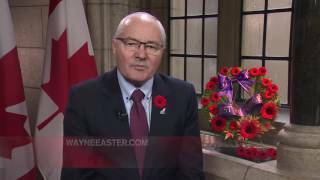 On Thursday, November 17th, 2016 I stood to honour my friend and long-term employee on the Hill, Michael O'Neill, who passed away. Mike's career began in 1981, first with MP Dave Rooney; then the NDP research bureau; and as luck would have it, in my office for the last 23 years. Saying Mike was unique would be an understatement. His corporate memory, his research and analysis, and his passionate approach to political issues were one of a kind. He did not seek credit or enjoy the spotlight. He was a sounding board, a quick and insightful thinker with so much filed away in his brilliant brain, and always ready to help such that even during his illness he provided wise counsel. Mike was probably most happy doing a critical analysis of the government, even when we were the government. To his wife Anne and daughter Eryn, we send our heartfelt sympathies. Michael O'Neill made this place a better place. His efforts improved the decisions for Canada, his loyalty was absolute. Our thanks go to Mike and his family.